Lindsey C. Sheppard B.A., J.D. Lindsey was born and raised in Red Deer, and looks forward to serving clients of Red Deer and Central Alberta. Lindsey prides herself on recognizing when problems can be solved using non-adversarial methods, and when some guidance or determination from the court is needed. Lindsey earned her Bachelor of Arts degree in Psychology from the University of Calgary in 2009. After taking some time off to travel in Europe, Lindsey attended law school at the University of Saskatchewan, College of Law and obtained her Juris Doctor degree in 2014. During her time at the University of Saskatchewan, Lindsey provided legal services to low-income individuals through the Community Legal Assistance Services for Saskatoon Inner City Inc. (CLASSIC). Lindsey was called to the Alberta Bar in 2015, and has focused her practice on Family Law, Collaborative Family Law, Real Estate, and Wills and Estates since that time. 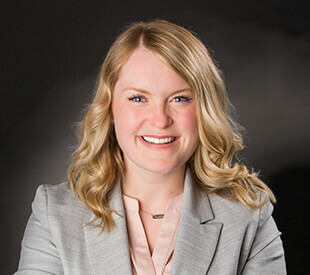 Lindsey prides herself in being able to assist her clients through all aspects of their separation or divorce, including any real estate transactions or estate planning. Lindsey also devotes a significant amount of her practice to clients not requiring family law services, but requiring assistance in the areas of Real Estate and Wills and Estates. Lindsey is a trained Collaborative Law professional, and is happy to guide clients through the Collaborative Law Process. Lindsey currently sits on the Board of Directors for the RDC Alumni Association, and is a member of the Canadian Bar Association, the Central Alberta Bar Association, and the Central Alberta Association of Collaborative Lawyers. Lindsey’s interests outside of the office include spending time with her family and friends, travelling, yoga, tennis, golf, and spin. For more information on Collaborative Law, please visit www.collaborativepractice.ca.